Later this month, Nissin Foods will be offering their ever popular Cup Noodles in yet another bold new flavor — the Cup Noodle Rich Luxuriously Thick Sea Urchin Cream. Sea urchin is considered a delicacy in Japan, and a pricey one at that, so it’s certainly not an ingredient that you’d expect in an instant ramen product. 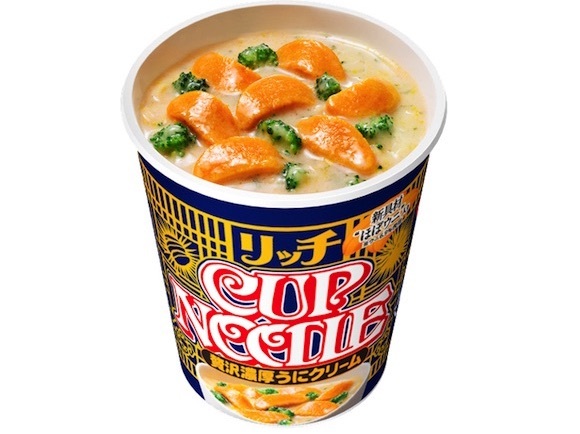 On the other hand, this happens to be the latest item in the line of Nissin’s luxury Cup Noodles, so we guess it’s not a completely far-fetched idea either. What’s particularly interesting is that they’re using not 100-percent real sea urchin, but a unique ingredient that they’re calling “almost real sea urchin” (hobo uni). This “almost real sea urchin” apparently contains 6.9% real sea urchin, but details of its actual content are not made clear in Nissin’s news release, perhaps in the same spirit as the “mystery meat” that is such a popular ingredient in their standard flavor Cup Noodle. While it isn’t the real thing, Nissin claims the “almost sea urchin” has been made to carefully recreate the taste of sea urchin, so that each mouthful brings you plenty of the rich flavor and aroma the ingredient is known for. The broth they’ve created for the item is a white, cream-based broth to which you add a special sea urchin and butter flavored paste as the finishing touch. And since sea urchin with pasta in a creamy sauce is a popular dish in Japan, the combination of the cream broth and “almost real sea urchin” flavor should actually be a good match. ▼ The “almost real sea urchin” looks pretty yummy in that creamy thick creamy broth. And see, there are little broccoli pieces in there, so you get your vegetables too! The Cup Noodle Rich Luxuriously Thick Sea Urchin Cream will go on sale across Japan starting Nov 19 at a price of 230 yen. If you want to enjoy a taste of sea urchin (or something almost like it anyway) without paying for the actual stuff, this might be a pretty good way to do so! -- Sea urchin ramen – Not for the faint of heart! This would "almost certainly" make me vomit. So 93.1% is something artificial-I got it! Luxurious MSG for those that demand the best neurotoxin. I almost want to throw up after seeing this monstrosity! In English we don't say "almost real". Something is real or it isn't. You can say something LOOKS real, but not almost IS real. Not surprised at all that one can say "almost real" in Japanese. The “almost real sea urchin” looks pretty yummy in that creamy thick creamy broth. And see, there are little broccoli pieces in there, so you get your vegetables too! Nissin, I love your ads. Not sure I am going to try this for real though. Also, thanks for supporting tennis god Nishikori! Sea urchin are the rats of the sea. My wife and I gather all we want when snorkling, slice them with my diver's knife, and eat the roe after dipping it in the ocean water - no other seasoning needed. Delicious. I abhor heated uni. I bet every item in the list of ingredients is 'almost' real too! kurisupisuNov. 13 09:19 am JST So 93.1% is something artificial-I got it! My guess is that it's the uni equivalent of surimi. If not . . .